The GUFE students were welcomed at the Berkeley College campus by a delegation of GUFE officials from China, the presidents of Berkeley College and Westchester Community College, and leaders of government and higher education in Westchester County. Click here to view more photos from the welcome ceremony. Photo Captions A and B: (Top) Students from Guizhou University of Finance and Economics (GUFE) in China are welcomed to Berkeley College in White Plains, NY, on January 10, 2018, by a delegation of GUFE officials from China, the presidents of Berkeley College and Westchester Community College, and leaders of government and higher education in Westchester County. 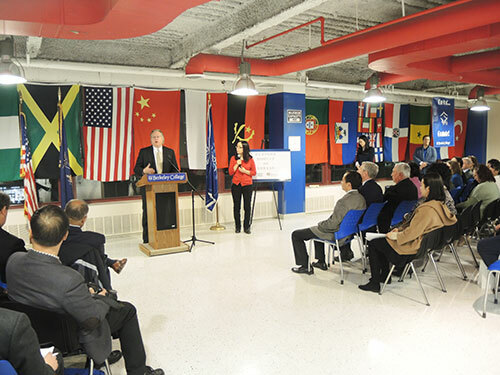 (Above) Michael J. Smith, President of Berkeley College, addresses students and officials from Westchester County and China about the Global Educational Collaborative between Berkeley College, GUFE and Westchester Community College. “I appreciate Berkeley College’s support of GUFE. I hope we can expand our partnership and that we can make progress together,” said Song Zhao, Vice President and Party Secretary at GUFE, assigned by the Ministry of Education of the People’s Republic of China. “To our students, we hope you can treasure this opportunity to study hard and build a positive presence here.” Mr. Zhao is part of a six-member delegation from China that visited Berkeley College and Westchester Community College in anticipation of the students’ arrival. The delegation also visited the Berkeley College campus in White Plains, NY, and the Westchester Community College campus. Photo Captions C and D: (Left) Song Zhao, Vice President and Party Secretary at GUFE, assigned by the Ministry of Education of the People’s Republic of China addresses students and officials from Westchester County and China on January 10, 2018, at Berkeley College in White Plains, NY, about the Global Educational Collaborative between Berkeley College, GUFE and Westchester Community College. (Right) Pictured from left to right are Thomas Roach, Mayor of White Plains; Michael J. Smith, President of Berkeley College; Ben Boykin, Chairman, Westchester County Board of Legislators; Belinda S. Miles, EdD, President of Westchester Community College; and Mr. Zhao. Berkeley College established the Global Educational Collaborative following several years of negotiations with GUFE. The Global Educational Collaborative Program at GUFE gives students from China the opportunity to earn their Associate’s degree at GUFE and complete their Bachelor’s degree at Berkeley College. To facilitate the process, Berkeley College faculty also teach courses at GUFE each semester to familiarize Chinese students with American pedagogical methods. In addition, GUFE students have participated in summer programs at the Berkeley College White Plains campus that focused on American culture and business. The collaboration also includes a faculty education element. This past summer, Berkeley College professors instructed faculty members from GUFE in teaching methods and practices at Berkeley College campuses. Visiting GUFE faculty participated in workshops focusing on instructional design, cultivation of student-centered teaching discipline, course design and development, and strategies for transcending language and cultural differences.